Automating repetitive tasks can be as simple as writing down the list of menus you want to use. Nisus Writer macros can activate any menu command by name. 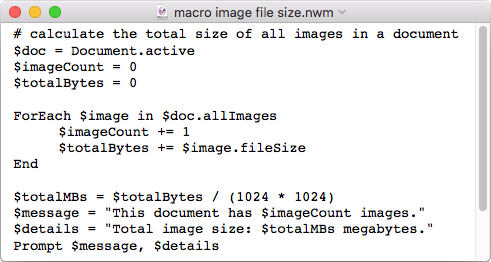 Macros have full access to document content like text, comments, footnotes, tables, formatting and styles. If you're an experienced coder you'll appreciate standard programming affordances like variables, arrays, hashes, loops, conditionals, functions, object-oriented data, and more. 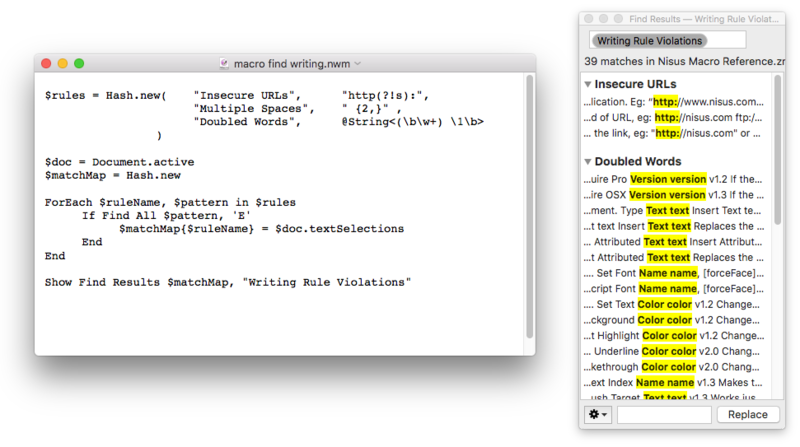 Macros integrate seamlessly with our extensive find features. Macros can search just like a regular user to select (or replace) text in open documents, or use specialized functions to customize searches and process results manually with code. Regular expressions (regex) are fully supported in macros, including a customizable string literal syntax that prevents you from unnecessarily escaping your search patterns. 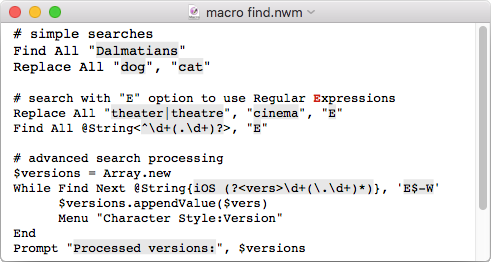 Nisus Writer macros even have a find option to automatically convert regex captures to local variables. All cross-references with missing targets (see example). All PNG images whose file size is too large (see example). All text violating particular writing guidelines (see example). To read more browse the Nisus Writer Macro Language Reference (download as PDF). Learn from our dedicated user community by participating in our online macro forum.